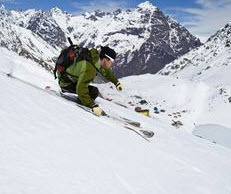 Tours de Sport Hot Deals: ULTIMATE SOUTH AMERICA SKIING & RIDING TOUR - HELI SKI, CAT SKI, PLUS CHILE'S TOP RESORTS! ULTIMATE SOUTH AMERICA SKIING & RIDING TOUR - HELI SKI, CAT SKI, PLUS CHILE'S TOP RESORTS! Packages start at $5,245.00 per person based on four travelers OR $7,125.00 per person for two travelers. Make the “endless winter” dream a reality and catch some southern hemisphere powder the new-fashioned way: dropping in with the help of private helicopters and cats. Chile has been on the map as an important South American ski destination for years, but it’s never been done quite like this before. The luxury digs, fine wine and easy access to vast tracts of virgin backcountry terrain in three different regions, all included in this itinerary, elevate the experience to a whole new level. Cool off this summer in true style. Loosen up those legs at La Parva, part of Tres Valles, and located close enough to Santiago to hit the slopes as early as noon. When you’re ready, an untouched off-piste paradise awaits. Leave your Santiago hotel for a day at Valle Nevado - Chile’s most modern, full-service resort. At an altitude of 12,040 ft. and holding an average snowfall of 23 ft., Valle Nevado has some of the most consistently remarkable powder conditions in the region. Loosen up those legs at Portillo, a South American institution known for its wide-open trails for all levels and little to no lift lines, located close enough to Santiago to hit the slopes as early as noon. When you’re ready, an untouched off-piste paradise awaits. Start early this morning on a full-day cat ski adventure at one-of-a-kind Ski Arpa. Unparalleled vertical snow conditions with views of Mt. Aconcagua on one side and the Pacific on the other make for an unforgettable experience. Dive into the so-called Powder Capital of the Andes, where snowfalls average 40 in. of champagne powder per storm and shred virgin drifts in an otherwise inaccessible backcountry goldmine, in this full day of heliskiing. The Ultimate South America package cannot be reserved online. You must speak with a Ski Arpa Travel Specialist to reserve a Ski Arpa Experience.